You are here: Home / Gardening Tips / What is Coconut Coir? Coco coir is made from the fibers of coconut husks. Once piled into landfills and forgotten, coconut coir has found a new purpose in the garden. Coco coir can be found lining hanging baskets and window boxes, and appearing as an ingredient in many plant growing mediums. 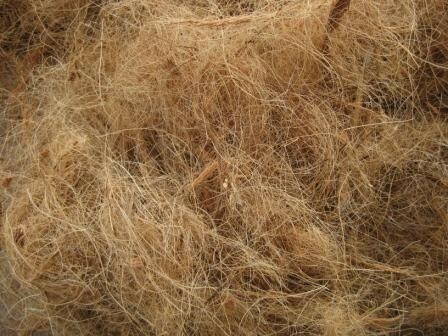 Coconut coir brings several useful characteristics to the table. It’s also a completely sustainable and environmentally friendly material. But what is it, exactly? 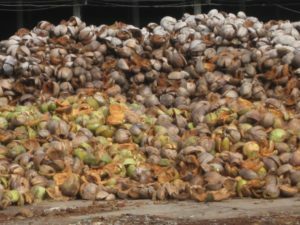 In a coconut processing plant, coconuts arrive covered in a course, brown, hairy material that surrounds the husk of the coconut. This is the coir. 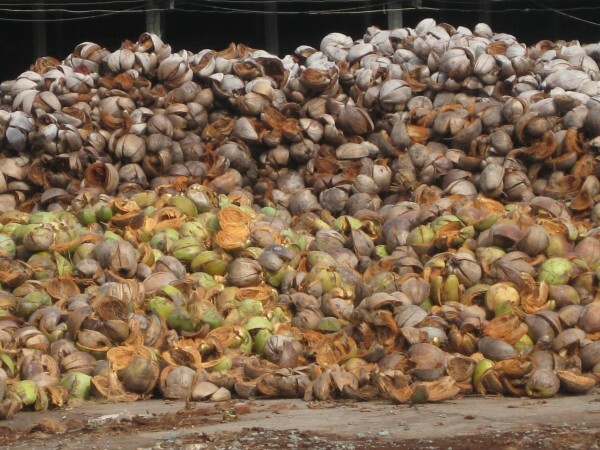 Until recently, it was frequently discarded as a waste byproduct of coconut processing. Today, though, the coconut coir gets a new life after being sorted by the length of the coir fiber. The longer, thicker fibers go to make mats and liners for planters and hanging baskets, while the shorter ones are chopped up and pressed into preformed liners and biodegradable pots. Leftover coconut husks are processed into a variety of products, including coir liners. Coconut coir is eco-friendly for lots of reasons. Also sold as “coco coir” or “coco fiber,” it requires little additional processing, is abundantly available, and keeps trash out of landfills. Compare that to a similar material, peat. Peat has long been used to line wire hanging baskets, but in recent years, it has become controversial because it’s harvested from peat bogs that have taken centuries to mature. Although restoration of harvested peat lands has been attempted, Washington State University researchers report that during the first several years after restoration, peat lands release extremely high levels of carbon dioxide, adding greenhouse gases to the atmosphere. While peat is a natural material like coco coir, it may not be the most environmentally friendly option for your garden. Line a hanging basket with coco coir to retain water in the soil. Container gardening can be challenging, and one of the biggest problems is keeping the soil moist. Potted plants can dry out much more quickly than plants in the ground. By adding a coconut coir liner to your window boxes or hayrack planters, you can help slow dangerous drying, since a coco liner can absorb about seven times its own weight in water. Over time, the liner will deal this water back to the soil. This helps plants stay hydrated without the disease risks associated with over-watering, such as fungus, bacteria, and harmful root rot. The water-retaining qualities of coco fiber are particularly valuable in hanging baskets. Exposure to drying winds often removes water from the soil and dries out the plants. Since coconut coir deals out water to the roots as needed, you have a little more room for error if you forget to water your baskets. Unlike a plastic liner, a coco coir hanging basket liner permits plenty of air penetration to roots, allowing you to plant your basket annuals much closer together than would be possible in a pot. Coconut coir liners are also incredibly durable and can be reused for many years if carefully handled. As they slowly break down, they will not change the pH of your soil significantly, since they have a natural pH of 5.5 to 6.8. What they will contribute over time, though, are lots of nutrients to your container soil, including the macronutrient potassium, as well as micronutrients iron, manganese, zinc and copper. Potassium is vital to bud formation in flowering plants; micronutrients contribute to plant health in numerous ways. Coconut liners are a sustainable gardening material that will help protect the plants in your window boxes and hanging baskets from the heat of the summer. Check out the wide range of coco fiber products available at Hooks & Lattice before planting this season. 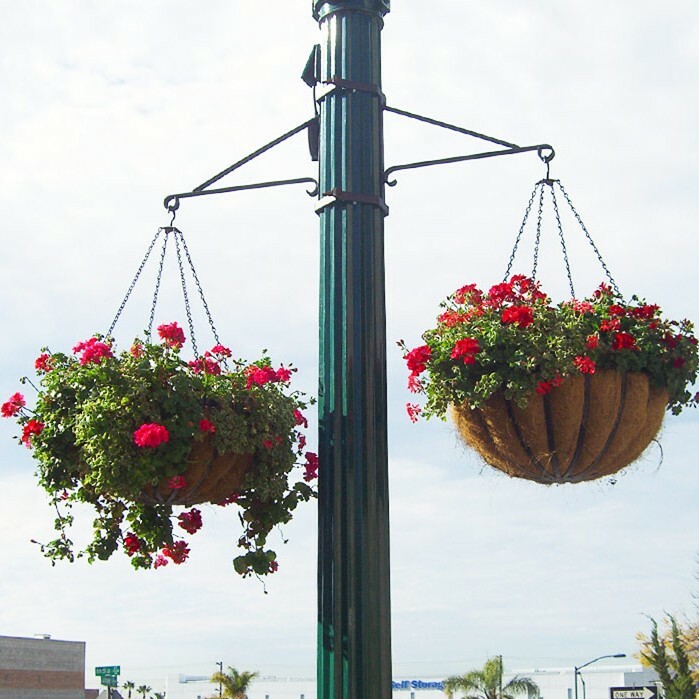 https://blog.hooksandlattice.com/wp-content/uploads/2013/03/coco-lined-hanging-baskets-e1383067538299-1.jpg 699 699 Kristi Waterworth https://blog.hooksandlattice.com/wp-content/uploads/2017/10/hl-blog-logo.png Kristi Waterworth2013-03-12 09:00:572017-08-14 17:26:45What is Coconut Coir?